Registration Deadline: EXTENDED TO April 30. Accepted students will be notified by May 1, 2019. Final payment for the conference fee is due on Friday, May 31, 2019. WCDA is offering two full-tuition scholarships for participation in the NextDirection Choral Leadership Conference. To apply for the WCDA scholarship, please use this link to access the scholarship application instructions and form. THIS SCHOLARSHIP IS FOR WI STUDENTS ONLY. 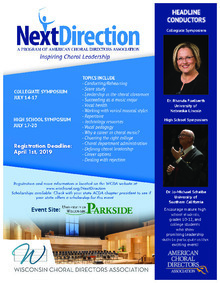 Applications for NextDirection Conference are extended to April 30. If one of your students attends NextDirection, you can go to REFRESH for FREE! Because WCDA believes so strongly in the value of music and its role in the elevation of the human spirit, NextDirection was created to bring together the brightest, most dynamic young people to consider a career in choral music. Teaming passionate, like-minded students with our professions’ finest nationally/internationally renowned choral leaders, they experience motivating rehearsals, discussions, and significant insight into the choral art. Through this significant, process-oriented exploration of the choral music profession, participants will gain a clearer vision of possibilities for their musical future. Download "Next Direction Flyer 2019.pdf"
Copyright ©2019 Wisconsin Choral Directors Association. All Rights Reserved.